*When I'm talking about indies for this topic, I'm referring to the handmade indie nail polish. Let's talk about indie nail polish again. I think it's been almost a year since we discussed this topic last. I think it's pretty clear in the past year that indies are here to stay. There are countless indie brands now, and there is definitely something for everyone! 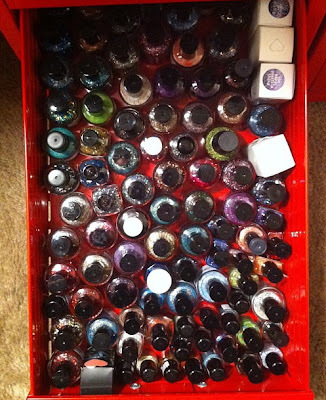 My Current Thoughts: I currently own around 120 handmade indie nail polishes. I still love indies. I will say that now personally, I find mainstream brands stepping up their game. Last year, I almost ditched mainstream brands all together and favored indies, but I think I'm purchasing a bit more mainstream now. I've become pickier with indies. There is so much out there now, that it takes a really creative polish, finish, and color combination for me to get interested. I'm sure it is that way for many. One good thing I noticed is outside a handful of select brands (ughh Lacquer Lust and Ninja Polish!!!! ), it is easier to get indies these days. The brands I most frequent seem to have a good stock of polish, where I don't feel a need to sit by the computer and stalk to the store to make sure I get a bottle! There are also etailers now that sell many indie brands. All in all I'm still an indie fan! These are my favorites because I've had the most experience with them, they have consistently good products, and they're really creative! There are of course, many other great indies out there, so my list is not the end all of things. I just have not had much experience with them or have not tried them. I really think if you love indies and have not tried Sea Lore, Sindie Pop Lacquer, or Maya Cosmetics you should check them out. I've always been really impressed with the formulas, creative colors, and fun collections with these brands! What are your current thoughts on indies? Love them? Not your thing? What are your favorite indie brands? I still love indies as well, but with so many out there it's easier to get selective. I love how the competitive market is encouraging mainstream brands to step up their game, it's forcing the market and provoking more original colors and finishes! My favorite indies are probably Cult Nails, piCture pOlish, (but I hardly consider either of these two indie anymore), Pretty Serious, Girly Bits, and Urban Lacquer. Some of the newer indies I'm not a huge fan of, but I'm partially biased since I'm not a chunky glitter fan. make a gorgeous shimmer/glass fleck and I'm sold. I agree with you on Maya, they don't get enough credit! I'm really behind on the indie craze but I love them. I love seeing all of the unique colors. There's so many that I want but it does add up and I only recently got my first ones for Christmas. I got a few Pretty & Polished and a few KBShimmer. I've only worn one of them, Pretty & Polished Jawbreaker and I loved it! The others are just as beautiful though. KBShimmer is definitely my favorite brand. I want just about every color they have. I definitely love indies but I am being more selective about what indies I purchase. It seems like there is a lot of repeating going on. My favorite indies are KBShimmer, Lac Attack, and Pretty & Polished. Second, the cost/risk. A lot of times the per bottle cost is only a little more than mainstream brands, but when I add in the shipping, the cost goes through the roof. When one bottle is going to set me back $15+....well, I can go over to Ulta and splurge on the Butter London for that. Having said that, there are a couple bottles on Etsy that I've been eyeing, but the cost keeps holding me back. I admit I'm a drugstore polish kind of girl at heart, especially now that they've really stepped up their color selection and quality. So I'll never say never, but I don't think they'll ever be a staple in my collection. I'm not a huge fan of glitter polish. I do have a few but I don't go wild over them. Therefore, I'm not a big indie nail polish fan. Especially now there are so many, they all look pretty much the same to me. I'm to the point where if I'm reading blogs and the post is about an indie brand, I don't even bother reading it. Indies ♥. But, only a few brands, like WingDust Collections, HARE, KBShimmer and obviously the larger and not hand made ones like a england and Cult Nails. I love indies, but I almost feel burned out by them-- mainly because there are so many! I try to be fairly selective these days and limit myself to 1 or maybe 2 polishes at a time. But it's also awesome that there are more brands, because it allows more people to buy them, where before it seemed like it was very difficult to get your hands on any of them. I'm also glad that there are bigger distributors these days, which also seems to make it a bit easier (Ninja Polish, Llarowe, Harlow & Co). It's not perfect, but it's better. And I totally agree that a side benefit of this has been that larger cosmetic/polish companies (OPI, China Glaze) have also upped their game. ^^ I'm exactly the same. I pretty much always hit "Mark as Read" on indie polish posts. I'm not a glitter fan either. I love me a nice shimmer or glass fleck, but those don't seem to be too popular to make amongst indie makers. I have exactly two indie polishes and one is a shimmer. The fact that the mainstream brands are starting to make loads of glitter polishes to try and keep up with the indies means that I've been saving sooooo much money lately (which is always a good thing!). I've never been a huge glitter fan at all. While some of them look really pretty, the removal process is just not worth it to me. It's so annoying. I have 2 indie glitters by Crows Toes - "Wonder Woman" and "I Make The Path." I really wanted "Wonder Woman" because I loved the show and I loved the colors she used to make it and I really do like this one and I will suffer the removal process when I do use it. "I Make The Path" was new so I just snatched it up at the same time (haven't even used it yet). I have a handful of mainstream glitters which rarely ever get any love from me (but they're pretty, so I'll keep them around). So all in all, indies are just not my thing. I do admire some of the swatches, but I never have a burning desire to own any of them. I love indies! I wish I had more indie polishes - I have several Lac Attacks (mostly from the HP collection, natch) and a Huemorista, but I think that's it.